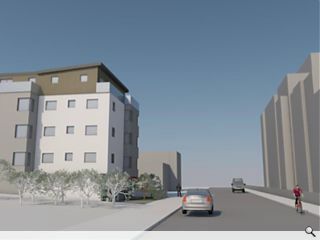 An application for the creation of 11 flats on vacant ground off Edinburgh’s West Granton Road has been filed by Ed Consilium, supplanting an earlier application for a taller building that was refused permission. The latest proposals have been drawn up by Cockburn’s Consultants by taking on board criticism of the original scheme by lopping off the top floor and expanding the amount of open space bordering Granton Crescent Park. Finished in white roughcast with timber lining above a grey brick basecourse the project will include undercroft parking for three vehicles as well as a further eight surface parking spots and a landscaped amenity area. In a statement: “The decreased height from the refused scheme to now incorporate 4 floors with parking and services at ground level is significant in that it now knits better with recent developments. The applicants believe that the revised scheme knits better into the surrounding urban fabric with a more visually interesting façade. The design, well......what can you say? I hope the developer includes traffic calming measures. That silver car is going so fast it's managed to get all four wheels off the ground. One can only guess from the render shown... that no quality architects have been engaged and that someone did not spend long learning sketchup? Is the render actually out of focus or are my eyes rejecting it? I'm not usually one to lend too much weight to the constant claims that planning creates 'uncertainty' for developers, but when a five-storey block next to a park is declined largely for being too tall and not providing sufficient amenity space, well, maybe the naysayers have a point. And we wonder why the sector is dominated by huge firms?